"Are you deaf or just defective?" January is often considered the dumping ground for films not competing in the awards circuit - sometimes unfairly. However, this feels somewhat apt to describe the release of PG-13 horror, The Bye Bye Man, which isn't the disaster some have dubbed it - but is by no means a particularly strong genre effort. With a narrative that feels like a loose riff on It Follows and Candyman, director Stacy Title's (of the excellent 1995 film, The Last Supper) film struggles to carve a mythology of its own, despite some atmospheric visual flourishes. 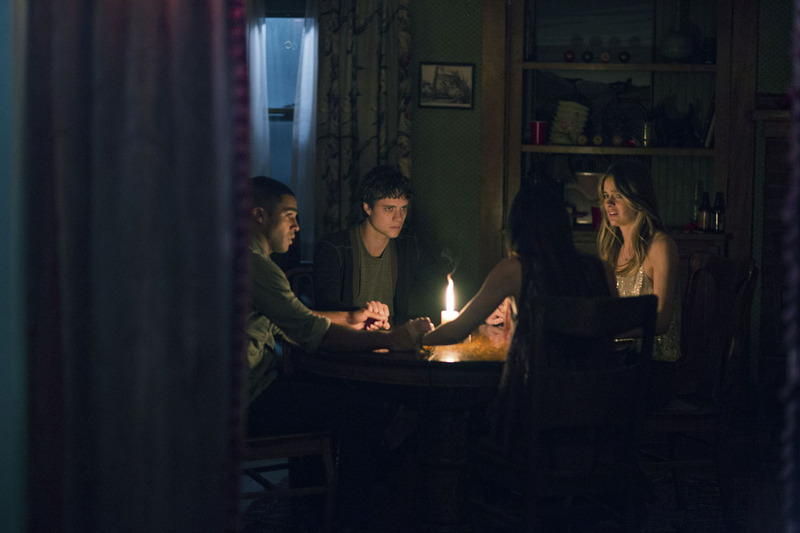 After his name is said aloud by three college friends, The Bye Bye Man appears, playing tricks on each of their minds, leading them to commit dangerous and violent acts. Jonathan Penner adapts Robert Damon Schneck's novel for the screen. Set in a creepy woodland house, Title is able to evoke some unease from the setting's cold attic rooms, wooden interior and leaky basements. She often opts for disorientation in these shots, with slanting angles and dimly lit rooms - giving The Bye Bye Man an occasionally unsettled atmosphere. 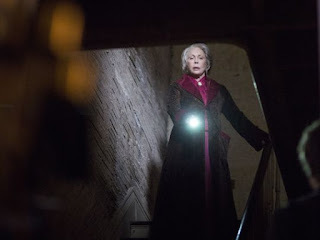 The usual genre frights also feature from the cloak that looks like the titular villain to the scratching noise coming from the basement, these more often than not lead to semi-effective jump scares. The real issue with The Bye Bye Man lies in a narrative that's simply quite hackneyed and ill-thought out. When the name of the film's villain is thought or said, you become a target - an undeniable raising of the stakes from the likes of Candyman, but we don't know why. The Bye Bye Man is given no development, origin or real purpose other than wreaking havoc - something that's occasionally admirable in horror films - not everything needs explained - but when you are crafting your film around a character like this, it needs some sense of mythology and origin. Without this, character motivations seem misguided, small narrative gripes pollute the film (the college's librarian is saved the student's home phone) and there's no real sense of tension built-up as nothing is particularly grounded. Now let's get to the real reason why anyone would see The Bye Bye Man, it contains Faye Dunaway's first "big screen" performance since 2002's Rules of Attraction. Whilst Dunaway only graces us with her presence for around three minutes, it's without question a highlight as the iconic actress pops-up to connect flashback events to the contemporary narrative. Always the consummate movie star, Dunaway commits to the role with an admirable gusto - even when the material she is given is questionable at best. Those that like a meta angle to their viewing might read more into the line "Are you deaf or just defective?" that Dunaway bellows to defectively-written lead character. Whilst the acting of the film's two leads Douglas Smith and Cressida Bonas is anything but convincing, British star Lucian Laviscount is at least aesthetically pleasing and charismatic. Carrie-Anne Moss gets an easy paycheck as the token detective and Cleo King is a welcome addition as the cute as a button innocent librarian sucked into the proceedings.